The data in this example are measurements of 159 fish caught in Finland’s lake Laengelmavesi; this data set is available from the Puranen. For each of the For each of the seven species (bream, roach, whitefish, parkki, perch, pike, and smelt) the weight, length, height, and width of each fish are tallied. Three different length measurements are recorded: from the nose of the fish to the beginning of its tail, from the nose to the notch of its tail, and from the nose to the end of its tail. The height and width are recorded as percentages of the third length variable. The fish data set is available from the Sashelp library. PROC CANDISC begins by displaying summary information about the variables in the analysis. This information includes the number of observations, the number of quantitative variables in the analysis (specified with the VAR statement), and the number of classes in the classification variable (specified with the CLASS statement). The frequency of each class is also displayed. PROC CANDISC performs a multivariate one-way analysis of variance (one-way MANOVA) and provides four multivariate tests of the hypothesis that the class mean vectors are equal. These tests, shown in Figure 29.2, indicate that not all of the mean vectors are equal (p < .0001). The first canonical correlation is the greatest possible multiple correlation with the classes that can be achieved by using a linear combination of the quantitative variables. The first canonical correlation, displayed in Figure 29.3, is 0.987463. A likelihood ratio test is displayed of the hypothesis that the current canonical correlation and all smaller ones are zero. The first line is equivalent to Wilks’ lambda multivariate test. The first canonical variable, Can1, shows that the linear combination of the centered variables Can1 =–0.0006 Weight – 0.33 Length1 2.49 Length2 + 2.60 Length3 + 1.12 Height – 1.45 Width separates the species most effectively (see Figure 29.4). PROC CANDISC computes the means of the canonical variables for each class. The first canonical variable is the linear combination of the variables Weight, Length1, Length2, Length3, Height, and Width that provides the greatest difference (in terms of a univariate F test) between the class means. The second canonical variable provides the greatest difference between class means while being uncorrelated with the first canonical variable. 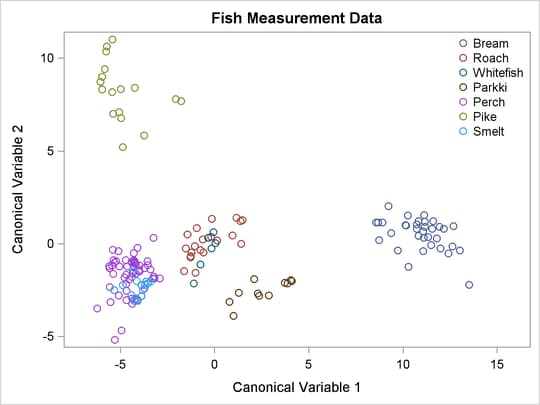 A plot of the first two canonical variables (Figure 29.6) shows that Can1 discriminates between three groups: 1) bream; 2) whitefish, roach, and parkki; and 3) smelt, pike, and perch. Can2 best discriminates between pike and the other species.